Last weekend was another weekend filled with trying out new recipes. 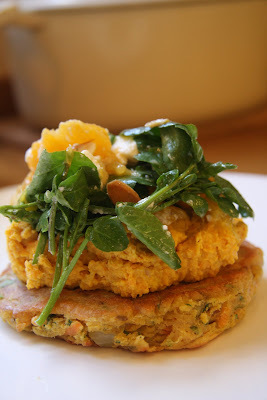 Maria Elia's Carrot Pancakes with Houmous and a Feta Salad looked ideal for lunch in front of the Bahrain Grand Prix. I wasn't keen on the idea of the orange in the watercress and feta salad. Fruit in salad (apart from my mum's grapefruit, chickpea and watercress salad) is not my thing. In fact I'd made the salad and was dishing up when I decided that if I was following a recipe then I really should trust the person who wrote it...so the orange went in at the last minute, and am I glad it did! It lifted the whole dish and really wouldn't have worked without it. Although the recipe looks like it has lots of steps it not that complicated really. The flavours work brilliantly - earthy roasted carrot in the houmous, light spices in the 'pancakes' and the zing of the orange with the peppery watercress in the salad. I'll make it again, but the carrot pancake batter needs to be lighter. I'll work on that (like I've been working on my vegetable bhajis ever since my mum recited her 'estimated' recipe over the phone to me sometime last year) and some days I might manage it and others...maybe not. Just leave the feta out of the salad to make this vegan. It has a unique flavour which really needs showing off... One of the nicest and simplest ways is to serve it lightly steamed and then tossed with red chilli, garlic, olive oil and a squeeze of lemon juice either as part of an antipasti type plate or as a side dish. I was about to include this in my meal plans for last weekend when I remembered a recipe in the Early Spring section of Paradiso Seasons by Denis Cotter - Purple Sprouting Broccoli with dried tomatoes and garlic on a corn pancake of leeks and puy lentils, with a rosemary cream. The title says it all...in fact I think it wins the prize for the longest recipe title of all time! I bought Paradiso Seasons a few years ago knowing nothing of Denis Cotter or his famed vegetarian restaurant in Cork, Ireland - Cafe Paradiso. The recipes in Paradiso Seasons, which won ‘Best Vegetarian Cookbook in the World’ at the Gourmand World Cookbook Awards in Barcelona in 2004, are (as the name suggests...) split into seasons, with Spring divided into Early Spring and Late Spring. If you try to eat local produce, when these seasons fall will undoubtedly depend on where you live and I find that here in London we can sometimes be a week or two ahead of my home county of Derbyshire for example. The recipes in Paradiso Seasons are the sort that I tend to choose on a Saturday morning whilst flicking through a few cook books with my morning cup of tea and then spend time leisurely preparing for a special weekend dinner. It's not that they're complicated or difficult recipes to cook, just that many of them have several different component parts and, above all, I take great pleasure in spending a few luxurious hours in my kitchen pottering away and creating something special for dinner! My dream, which almost goes without saying, is of course to eat at Cafe Paradiso at some point in the future. I've never been to Cork but I hear its a lovely city to visit, so I have my eye on a weekend away and, what I expect would be, an amazing meal at Cafe Paradiso! So, the recipe... The purple sprouting broccoli is the star of the show and, as Denis Cotter says himself, the rest of the dish is there to enhance and support this star ingredient. The result is actually quite a light dish (despite the cream sauce) which is perfectly balanced, both in tastes and textures and also as a vegetarian meal. 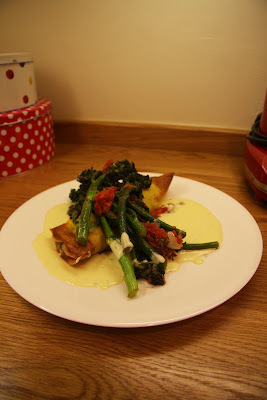 The rich cheesy leek and lentil mixture wrapped in a thin lightly spiced corn pancake works well as a base for the mountain of lightly cooked purple sprouting broccoli. Don't be tempted to leave the rosemary cream off the plate...it complements both the pancake and the broccoli which for some reason amazed me as, whilst I would put rosemary and cream with the pancake ingredients of leeks and puy lentils, I would not have expected them to be such good partners for broccoli and tomatoes. Instead of dried tomatoes, I used semi-dried tomatoes in oil which I already had in the fridge, but I think they were a little too soft and broke down too much, so I'll seek out some dried tomatoes for next time (and there will definitely be a next time!). (Denis Cotter has kindly said that I can reproduce his recipe here so watch this space for an update...!). 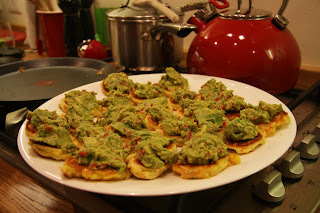 I spied a really interesting canape recipe on The Passionate Cook's blog a couple of weeks ago and it was just the ticket for an informal help-yourself-to-how-much-you-fancy (or the-boys-eat-the-most-and-we-all-fight-over-the-last-few) starter - Mini-Corncakes with Avocado & Lime Salsa. Super simple to make and I really liked them. They'd go down just as well at a swanky canape and champers evening as they would at an afternoon in watching the footie with some mates. 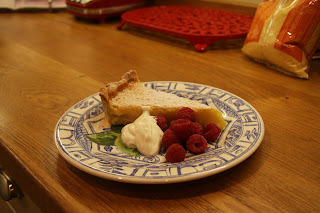 On a rainy day on holiday in France during the Rugby World Cup a couple of years ago I did a lot of cooking and baking. We got through over 5 packs of butter between two of us in less than 2 weeks... Needless to say I couldn't get into any of my work clothes on my first day back in the office after the holiday! Make the pastry by combining all of the ingredients - I do this in my food processor but the 'traditional way' is to rub the butter and flour until it looks like fine breadcrumbs and then add the sugar followed by the eggs and mix until the pastry comes together. Wrap the pastry in cling film and chill in the fridge. 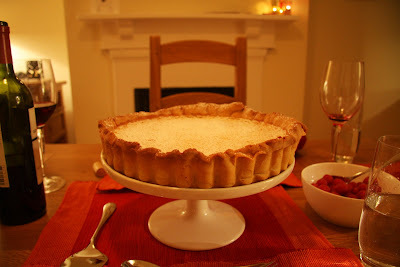 Roll the pastry and line a loose bottomed fluted tart tin and put that back in the fridge for at least 20 minutes. In a clean bowl, mix the eggs, egg yolks and sugar. Then add the cream, lemon and zest. Preheat the oven to around 190C and bake the pastry case with greaseproof paper and baking beads for about 10 minutes. Remove the paper and beads and bake for another 5 minutes or so. Reduce the oven to 150C and pour the filling mixture into the pastry case. Bake for 35-40 minutes until set. It's not just about the sweet sherries your granny drinks like Harvey's Bristol Cream and Croft Original. Sherry (or Jerez, or Xerez) - the generic name given to these fortified wines unique to this area of Spain - are as varied and complex as other wines (some would say more so...). Fino is a light dry dry sherry drunk young and chilled. Manzanilla is a matured, slighly salty tasting, fino typical to Sanlucar. Amontadillo is darker and more robust. Oloroso is fragrant and complex - sweet oloroso makes a perfect dessert wine whilst the drier oloroso is great in cooking. Then finally, there's Pedro Ximenez, which is dark and syrupy, in fact some of the ones we tasted were oddly akin to Buttercup cough syrup! 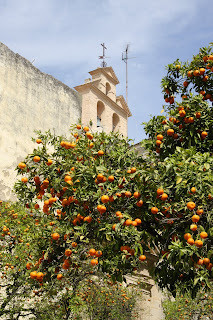 Before arriving in Jerez I had never tasted any sherry other than the sort of pale cream sherry which was the preferred tipple of my grandparents' generation. Time to pop my sherry cherry came on day two of our holiday at El Gallo Azul - one glass of chilled fino and I was hooked! (Until my first 'fino-hangover' a few days later after which I drank considerably less of the stuff). Not only a perfect aperitif, it also drinks really well with seafood and tapas (stood at the bar of course!). 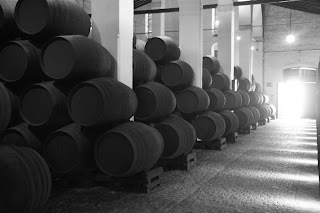 We visited two of the bodegas for which Jerez is famous during our stay - Bodega Gonzalez-Byass and Bodega Pedro Domecq - learning about the production of sherry, the most important part of which is the ageing process and in particular the solera and criadera system, whereby the young wines are gradually blended with the mature wines. The Gonzalez-Byass tour was an 'all singing, all dancing' tour and, although very touristy, it was really well conceived and great for those of us who knew nothing about sherry. Tio Pepe is their best known brand and the tasting of this light fino are fairly generous at the end of the tour...! What I did find interesting was that the American oak barrels in which the sherry is stored are used by Gonzalez-Byass 30 years and then for another 20 years to store their brandy, after whch they are sent to Scotland where certain whisky producers use them to store whisky for the final 20 years of the barrels' lives. We had a far less 'touristy' tour of the the Pedro Domecq bodega which is now American owned. The buildings and gardens are beautiful here and the tour guide willing (if a little difficult to understand). There were only four of us on our tour which meant lots of opportunities to wander off and take photos of the barrels and buildings. For fresh vegetables, fruit, fish and friendly market sellers, head to the Mercado on Plaza Esteve. You can spot the best stalls - they're the ones with 10 old ladies queueing up to be served. What a delight to be able to sample some early summer alcachofa (artichokes), habas (broad beans) and esparrago (asparagus) after the endless months of root vegetables in England! After all that hard work shopping at the market, weary feet need a rest and they don't need to go far to find it... If it's breakfast time then La Vega also on Plaza Esteve is the place to go for churros - sugar coated long thin doughnuts which are bought from the man who cooks them fresh at the back of the cafe. You'll see lots of people eating them - groups of women in the cafe, school girls congregating outside - but I have to say I wasn't a big fan. To me they tasted like savoury (slightly salty even) doughnuts dipped in sugar which was an unusual combination. Whether you like them or not, they are best eaten with the hot chocolate which, for chocolate lovers, is heaven. It's just melted chocolate in a cup really! For an early aperitif, Bar Pampero, a spit and sawdust bar right outside the market is perfect for a fino (or three) and some delicious little green olives. We idled away a good hour or so sitting here in the shade watching the world go by one lunchtime. The bar is mostly full of men of all ages - mostly in groups or looking after their children or grandchildren! Bar Juanito (c/Pescadaria Vieja - just off Plaza Arenal): Go for lunch on a sunny day and sit at one of the brightly coloured tables outside. Order the 'infamous' artichokes! 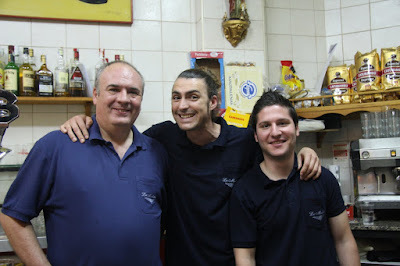 Bar La Moderna (c/Larga): The best papas alinas in town!! On a weekend evening this place is packed out with a total mix of people. Head there to soak up some atmosphere, propped up at the bar with a beer and a plate of the papas alinas. Bar La Medina (in the Zoco de Artisania): A lovely setting for a lazy lunch (and it will be lazy...they're late starting service even by Andalucian standards and then will only serve what is actually ready...!). Great staff who are happy to recommend something typically local for you to try. 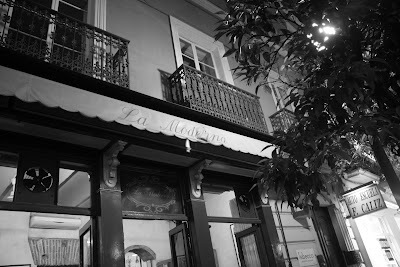 La Marea: We stumbled upon this place one fino-fuelled evening because it looked lively and atmospheric...and full of locals (always a good sign?!). Go for plates full of fresh seafood and funny looks from said locals when you haven't got a clue what you're doing and you speak only about 5 words of Spanish! Bar Las Bridas (Paseo de la Rosaleda 4): There isn't really a menu here (although they'll give you one if you're struggling). Just grab a table and then let the owner show you what is on offer that evening. 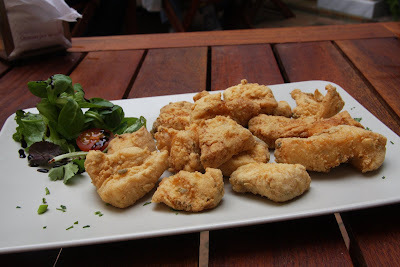 It's only a 10 -15 minute walk from the centre of Jerez and worth every step - try the gallo empanado (john dory goujons). Most days we wandered around the narrow streets in the different districts of Jerez which was a great way to get to know the city. It also meant that we stumbled across the Zoco de Artesania (Handcraft Market) where there are three floors of small shops selling artisanal products from Southern Spain and North Africa - beautiful handpainted pottery, brightly coloured throws and Moroccan tea glasses. Set in the middle with a lovely big terrace was Bar La Medina where we ate lunch a couple of times. We spent a lovely hour or so wandering around the Alcazar in the sunshine. The best bit for me was the Camera Obscura where you can see everything on the streets below in amazing detail as well as the vineyards and sea in the distance - 20 minutes of looking around the city without having to walk anywhere! Finally, for a bit of luxurious relaxation on our last day, we headed to the Hammam on c/Salvador 6. The idea is to start off in the warm pool and then alternate between the hot and the cold pools, staying as long as you can bear it in the cold pool (not very long in my case...!). We stayed in a perfect spot on Calle Francos in a beautifully renovated apartment which (most importantly!) had a lovely big living space and dining table as well as a well equipped kitchen (http://jerezapartments.co.uk/). 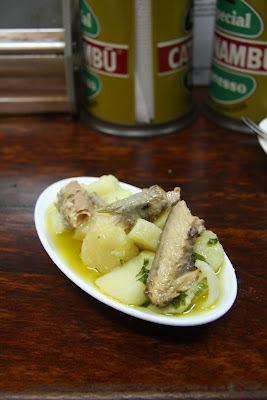 We ate lunch at Bar Juanito (c/Pescadaria Vieja - off Plaza Arenal) on our first day in Jerez. 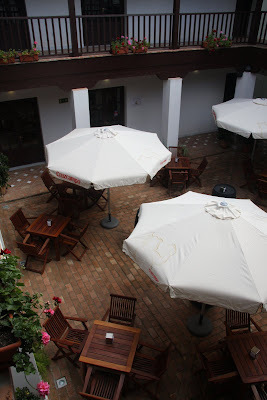 It's a lovely restaurant set in a little alleyway leading off Plaza Arenal. We sat outside at a little table with a brightly coloured tablecloth and pretty green chairs. Bar Juanito comes highly recommended in lots of guidebooks and it well known for its artichokes which, whilst very tasty, weren't as mind blowingly good (if artichokes can ever be mind blowing!) as I'd hoped. 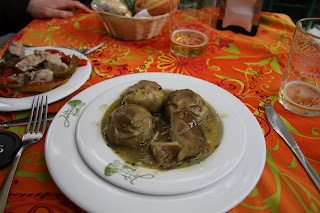 They were served warm in a house specialty sauce - plain and simple which let the artichokes speak for themselves. We also ordered a tuna and pepper salad which was fresh and light, although a touch too much of the local Vinagre de Jerez for me. 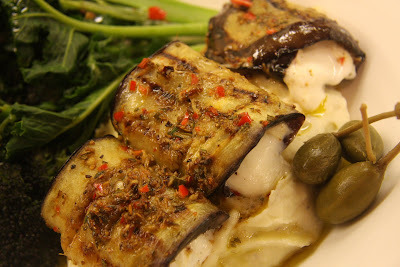 The waiter recommended the hake which was done in a very light batter and cooked to order - fresh, light and very tasty! We consumed a fair bit of the house vino tinto which was extremely palatable (isn't anything after 2 glasses at lunchtime?!) - served from the bottle at the table. All in all it was a good lunch and a popular spot with locals and tourists alike, but maybe after everything I'd read my expectations were a bit too high...! We'd read about this bar in a guide or article somewhere which said what a great bar it was with a lively atmosphere and a varied clientele, where families with children, young couples and businessmen in suits all rub shoulders in the afternoons and late evening. But when we first wandered past thinking we'd stop for quick drink it didn't look at all welcoming with it's rather shabby decor and dark interior so we gave it a miss wondering whether we'd found the wrong 'La Moderna'. Thankfully, on the Friday evening towards the end of our week in Jerez we decided to give it another go, when it was our first stop on what turned out to be a great night out! People were spilling onto the street in front of the bar, there were still families with young children sat at the few tables by the open front of the bar when we arrived after 9pm and lots of people seemed to be stopping by to greet people they knew who were sat there enjoying the warm evening. We ordered a couple of beers and stood outside for a while before venturing in to find ourselves a spot at the bar to order some tapas - papas aliñás (a salad typical of the Cadiz region with potatoes, spring onions, tuna and eggs) and croquetas de bacalau (salt cod fritters). I had my camera with me to and for some reason that night everyone wanted their photos taking so I obliged - everyone was so high-spirited that I didn't want to refuse (nor was my 10 word Spanish vocabulary sufficient to explain that I wasn't a photographer by trade...). We eventually managed to get ourselves some bar stools and sat up at the bar conversing with the waiters in sign language and pigeon Spanish and English and wished we'd found this place earlier in the week. La Moderna is a great bar with super friendly staff. 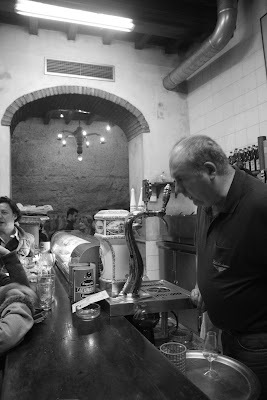 If you can wrestle yourself the to bar, elbow your way in and catch the attention of one of the waiters to order a beer or a fino and then stand there and soak up the lively, happy atmosphere. 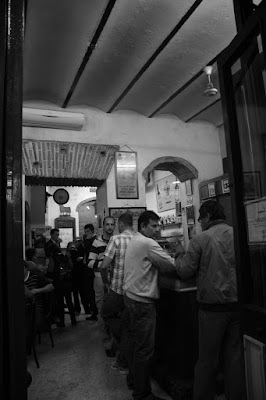 Yes, the decor is past its best and no you probably won't get a seat, but even if you only stop by for one, make sure you order the papas aliñás (the best we tasted in Jerez) and have a chat with the waiters. First was a big plate of papas aliñás (with plenty of fresh spring onion) which was tasty - the potatoes were firm and waxy and the dressing well seasoned. It's a dish that traditionally contains hard boiled eggs and, as I don't eat eggs (they make me feel poorly...), it can be difficult if the eggs are chopped up so small that I can't pick them out - this was OK but Andrew ended up eating most of it. Then came two little bowls of Salmorejo, one with some chopped jamon de serrano and the other (for me) without. Salmorejo is a soup made with tomatoes, bread, oil, garlic and vinegar which originates in Cordoba. It is similar to gazpacho, but much thicker because it is made with more bread. It was a great introduction to this cold soup which I later ate in many different guises, both warm and cold. Finally, our waiter brought out some freshly fried cazón en adobo - beautifully fresh bite sized pieces of cazón (dogfish) in a light and perfectly seasoned batter. I was so taken with these little 'fish nuggets' for want of a better term, that I recreated them back at our apartment a few days later. 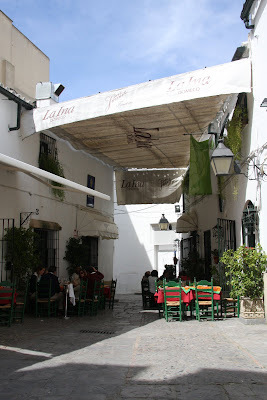 A perfect spot for a long lazy lunch in the sunshine and if, like me, you don't speak much Spanish then just point at the plates of food heading for other tables that take your fancy and ask for the same - you won't be disappointed! Inspired by an amazing recent holiday in Andalucia, my food blog (which has spent a very long time stuck at the 'thinking' stage) has finally made its first tentative steps from the drawing board to reality... Like most of those great new ideas I have whilst relaxing on holiday it nearly didn't happen, but here I am and I glad it did!